As Christmas is about 3 weeks away, I think it is time to start making some new flavoured cookies for sampling. Not only for Christmas but also for Chinese New Year which falls on 23 Jan 2012. How time flies. In less than two months, we'll be celebrating Chinese New Year. For today's Almond Cranberry Cookies, I used the leftover cranberries from my Cranberry Yogurt Chiffon Cake. The recipe was adapted from the book of 孟老师的的100多道手工餅乾. These cookies are made using the rub-in method just like for short crust pastry. You don't need a mixer to mix the ingredients, very easy! 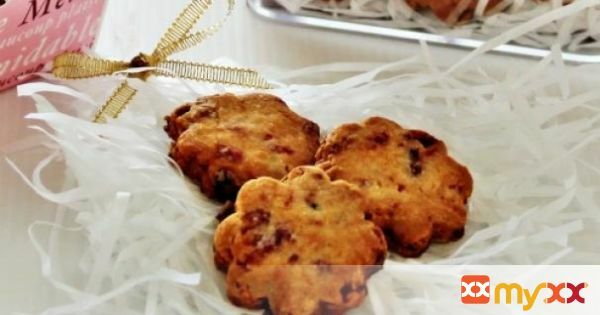 The crunchy cookies have an almond aroma and a slight tangy taste of cranberries. I would prefer to add in a little more dried cranberries to give an extra tangy taste the next time I make these cookies again. The recipe is definitely a keeper for sure. 2. Toast almond flakes at 160C for 5 mins and leave to cool. 3. Blend almond flakes and dried cranberry separately in the grinder and mix them together in a bowl. 4. In large bowl sieve in plain flour, icing sugar and mix together with ground almond. 5. Add in cold butter and rub with your finger tips and both of your hands till mixture becomes sandy. 6. Add 1 tablespoon fresh milk into the cranberry mixture, mix well and add into the flour mixture. 7. Mix well with a rubber spatula and knead into a dough. 8. Roll out the dough in between two plastic sheets to about 1 cm thick. 9. Cut out shapes using your preferred pastry cookies cutter and place them on a baking tray lined with parchment paper. 10. Bake at 170C for about 15-20 mins or till golden brown. 11. Remove from heat and cool on wire rack then store cookies in an airtight container.